An astronaut in space has many tasks, from monitoring experiments to maintaining equipment to organising the more than 70 000 objects that are on the International Space Station, as well as staying fit and healthy. Astronauts have 24-hour support from mission control to keep track, but to explore farther out into our solar system, they will need more autonomy. 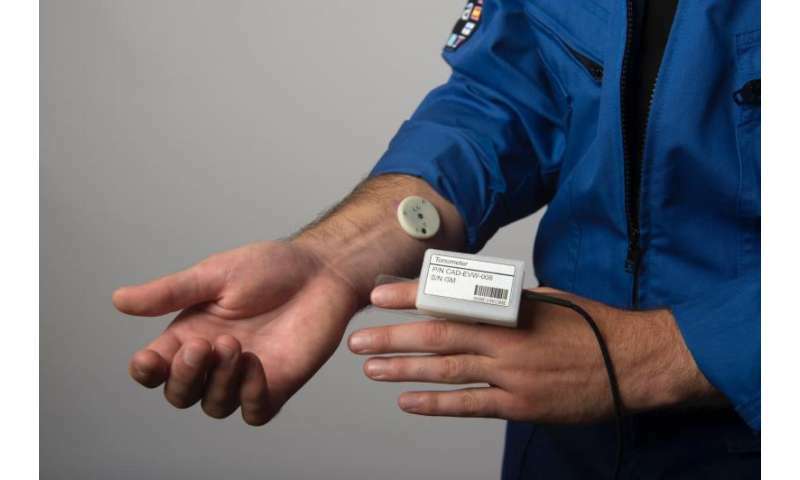 France's space agency CNES with space medicine specialists MEDES have developed a personal assistant for astronauts to use via a tablet called EveryWear. ESA astronaut Thomas Pesquet will be the first to use it during his six-month Proxima mission. The EveryWear app aims to offer one interface for a variety of health-related tasks – both medical and research. Currently, astronauts record the food they eat for their flight surgeons or medical experiments by noting down each food item they consume during the day. With EveryWear Thomas can simply take a photo to scan the bar code of a food item before eating – the app will record the calories and provide a nutritional assessment and compare the result with his personal target defined before the flight. A second use for EveryWear is combining input from three wearable sensors: a tonometer to record how Thomas's arteries react to weightlessness; a smart shirt that records his electrocardiogram during exercise and a patch (shown here) that records Thomas's skin temperature to monitor his sleep patterns in space. EveryWear also offers support for experiments, such as AquaPad, that are being tried as a new way to ensure water on the space station is not contaminated. Thomas simply takes a picture of a specially developed petri-dish and EveryWear processes the picture to calculate the amount of bacteria in the water – confirming whether it is safe to drink.